(Brea, California) June 26, 2018 – An amazing grouping of extraordinary quality California fractional gold coins were recovered during the latest mission to the fabled “Ship of Gold,” the SS Central America, that sank in 1857 on a voyage from Panama to New York City, according to the California Gold Marketing Group (CGMG) of Brea, California. Many of the coins are now the finest known. “A total of 112 privately-minted, California Gold Rush fractional coins in denominations of 25 cents, 50 cents and $1 were retrieved from the Atlantic Ocean, and an unprecedented 54 of them now have been designated prooflike by Professional Coin Grading Service,” revealed Dwight Manley, CGMG managing partner. One of the superb sunken treasure 50-cent fractional coins was graded PCGS MS68+PL. Part of the finest group of its kind in history, this 1856 gold 50 cent coin (BG-311), now graded PCGS MS68+PL, was among 112 California fractional gold pieces recovered from the fabled “Ship of Gold,” the SS Central America. The California fractionals were among more than 3,000 gold coins recovered in 2014 from the SS Central America but only recently examined in detail, cataloged by Breen-Gillio reference numbers and graded. 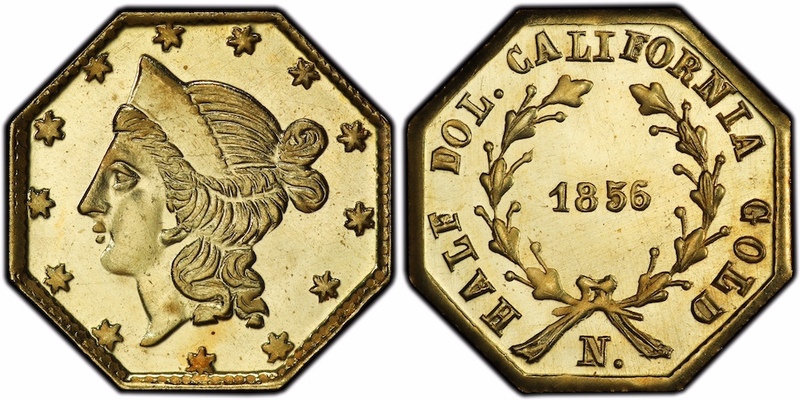 “In 2014, when we first saw these coins lying in the shipwreck’s debris field, I realized how it illustrated the importance of California fractional gold in the day-to-day commerce of 1857 California. For instance, 11 of these delightful little coins were mingled within one remarkable jumble of 264 pieces of gold currency: 236 U.S. gold coins of every denomination and 17 foreign gold coins,” said Bob Evans. He was the chief scientist on the 1980’s missions that first located and recovered a portion of the fabulous SS Central America treasure and then assisted with the 2014 recovery. “As I curated these fabulous wonders under the microscope I was struck by both the crudeness of their manufacture and by the remarkable state of preservation, many of them looking as if a San Francisco jeweler had minted them yesterday. The dozens of prooflike specimens are truly stunning!,” Evans added. 1855 $1 (BG-533), PCGS MS64PL. Each of the PCGS-certified fractional gold coins now is encapsulated in specially-produced and labeled holders that contain a pinch of recovered SS Central America gold dust in a separate compartment. The insert label includes a statement of authenticity hand-signed by Evans. “The SS Central America treasure is literally a historic and financial time machine, taking you back to the minds of the public during the California Gold Rush,” stated PCGS Co-Founder and Collectors Universe President David Hall. “At one point as I looked at all of the fractional gold coins together it was almost a startling out of body experience for me. I imaged myself in a restaurant or a bar in 1857 as I wondered what a steak and beer would cost back then? Would I have to give them a 50-cent gold piece or a $1 gold piece? It was like being there in 1857,” recalled Hall. In the coming weeks, additional highlights of the recently examined and certified treasure will be revealed. A complete inventory of U.S. and world coins and assayers’ ingots recovered in 2014 will be listed in an upcoming book, America’s Greatest Treasure Ship: The SS Central America, The Second Journey, by Q. David Bowers and Manley. It will be published by the California Gold Marketing Group later this year.